If the answer to the above question is that you download WhatsApp then this post is for you people. WhatsApp is the one most famous messing app used these days worldwide. It is the cross-platform messaging application for Android/iOS. After Facebook’s procurement of the WhatsApp, it has been in new for Facebook-WhatsApp sharing data policy. WhatsApp has rolled up various new features like WhatsApp free voice calling, WhatsApp video calling, pin WhatsApp chats and the most recent is video status update. Nowadays, people don’t even usually use normal text messages which they get free with their recharge on their mobile number. While, WhatsApp is used to chat, send photos, videos, contacts, and location; it does not have an inbuilt scheduler available in its official app. Now the question arises, what does scheduling the messages on WhatsApp actually mean? By scheduling WhatsApp messages I mean that what if you want to send a message to a person at a specific time or a reminder to pack something. WhatsApp does not provide you with this facility. Here’s a small trick which will let you to do the same on your WhatsApp. I have mentioned below some steps through which you can schedule your messages on WhatsApp. You need to fulfill the following requirements to use the following methods. If you want to enjoy whatsapp scheduling in Whatsapp mod then you can try out famous gb-whatsapp application 6.30 Happy Reading!! KingoRoot is an app which enables you to root process with just one single tap. How cool is that! Isn’t it? Go to Settings, tap on Security, scroll down to Unknown Sources. Now, toggle the switch to ON position. Download and install KingoRoot on your android device. Tap on One Click Root. Fingers cross! If everything is correct, within 6p seconds your device will be rooted. Download and install the WhatsApp Scheduling App on your Android device. After the installation, you’ll be asked for Superuser permission to proceed. Grant the access for the same. Click on the pencil icon next to the Pending messages option. Now, select the contact which can be a person or a group, type your message and schedule the time for the same. Tap on the Add option. Cheers! You are ready for your scheduled message. Download and install the WhatsApp Scheduling App on your device. After the installation, you’ll be asked to enable accessibility settings to schedule messages. Tap OK for the same. Now, tap on ‘+’ to create a schedule. Now enter the message to be scheduled. Once you schedule the message, you’ll see the scheduler task on your home screen of the scheduler app. SQEDit is one of the best and easy to use scheduling app available. It is free of cost. Download and install the SQEDid – Auto Scheduling App on your Android device. Now, launch the app. Create an account or you can even sign up using Facebook. Now, tap on ‘WhatsApp’ to continue. Now, you’ll be asked to grant permission to access your contacts. Grant the access for the same by tapping on ‘Allow’. 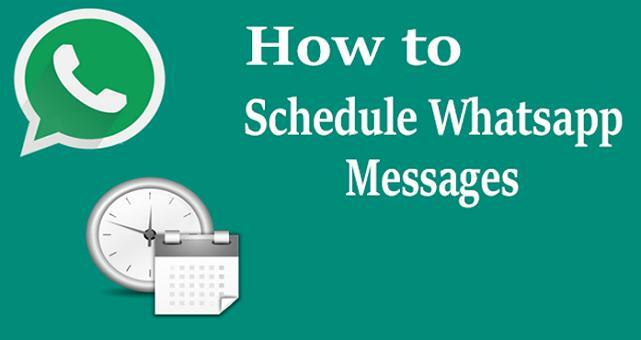 Now, set the message date and time on which you need to schedule the message. After setting the scheduled time, click on ‘Send’ button. Now, choose the contact or the group you need to schedule the message to. Blimey! You are done with scheduling the message. The ability to schedule is one of the important features for me on WhatsApp as it swipe away the stress of remembering everything. It is a form of an automation which if used effectively can be productive and reduce your workload up to a great extent. The above 3 methods available have a major drawback that you need to use an additional app to schedule your WhatsApp messages. But this is the best available. Hopefully, this facility will be available in the official app soon as well.